If you want a box with an ice-pack, then the Fit N Fresh might be what you are looking for (although there are some Daiso as well as Lock n Lock plastic boxes that have a section under the lid where to fit in an ice pack). Some of the Fit N Fresh range is available in Spotlight at Plaza Singapura – great place to shop because if you can also check out Daiso and the Lock n Lock range at Carrefour at the same time! Just Bento has reviewed a small Fit N Fresh chiller plastic box here. Personally I wasn’t impressed, the lunchboxes aren’t very attractive, don’t look leakproof and don’t seem to be particularly well-made, certainly not of the quality one might expect from a US brand. Anyway, these are not especially useful for me because my packed lunches are almost always rice with side dishes that are best warm or at room temperature, rather than chilled. Finally! I have found functional bento boxes (as opposed to cutesy and child-sized type which are plentiful in Daiso) in different capacities on sale in Singapore! If you’re looking for a basic bento box similiar in design to my Asvel box, head straight to Meidi-ya. Lustroware clear boxes in three sizes: 490ml (S$13.90), 670ml (S$14.90), and 890ml (S$18.90). They are microwavable, have leakproof seal, and a movable divider. There are also dark grey and black, very large men’s style bento, some of which come with insulated slipcase, and which cost up to S$31.90. There are single layer and double layer men’s boxes. The boxes are all labelled with Ag+, indicating silver ions to give the plastic an anti-bacterial property. All the Lustroware boxes which I saw in Meidi-ya are manufactured in China for the Japanese market. Learnt about this via postings on the Failsafe Yahoogroup for those following the Failsafe food intolerance programme. Qubies are ice cube trays that make 30ml-sized portions, perfect for feeding babies, but also for anyone who needs to freeze foods in small portions. Regular ice-cube trays divide up into portions that are too small for foods. 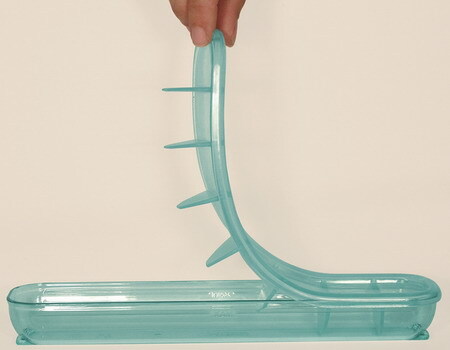 The unique thing about Qubies is also that the dividers are in the lid. Then again, Qubies aren’t cheap at AU$16.95 each (excluding postage). The cheaper, but less elegant and more space-consuming option would be use a bunch of stackable Lock & Lock E-Z Lock containers, which is what I have been doing so far. However, the smallest E-Z Lock is 190ml, which is sometimes be too big. Canton Pixie has mentioned in the comments on this blog her method of using disposable (but washable & reusable) plastic sauce or pudding containers from SKP to freeze baby food. For those living in the San Francisco area, I just heard about this event, the Asian Culinary Forum. To celebrate our 2008 theme, “Asian Food Beyond Borders,” ACF is presenting an entire weekend of exciting classes, tours, workshops and panel discussions for your enjoyment. Choose your heart’s desire from our extensive a la carte menu of educational events. To attend any of the Friday and Saturday classes below, register online securely and conveniently. Learn more about our guest instructors, speakers, and presenters on their bio page. Open a fresh coconut, drain out the coconut water and scrape out the flesh with a teaspoon to create small pieces that will fit nicely in to the bottom of the jelly moulds. One packet of agar-agar powder is enough for one litre of liquid, so adjust accordingly. The sweet taste of the coconut water seems to diminish when they are made into jellies. Unless you have a delicate palate, these will seem tasteless, with a creamy touch from the coconut flesh. These were larger jellies made in sillicone baking cups. However, I noticed a strange taste from these jellies that those made with the plastic jelly moulds did not have. The odd taste was so strong that it overwhelmed the very delicate flavour of the coconut water. Don’t forget that agar-agar doesn’t melt so these are excellent additions to bento boxes in hot weather. You might also want to have a look at my other jelly recipes (agar-agar & konnnyaku). This is such a simple recipe, I wish I had thought of it before! Full credit goes to our family’s domestic helper who came up with the idea and made the agar-agar :). Here’s another experiment with alternative flours and this one is actually gluten-free, adapted from The Best Wheat and Gluten Free Baking Book. This is my first completely wheat and gluten-free recipe made with alternative flours intended to mimic the result of wheat flour. I didn’t have the exact combination of flours used in the book’s recipe for Squash Muffins, so I improvised from things I had in the kitchen, and I was pleasantly surprised by the palatable result. So you too should not shy away from experimenting with alternative flour mixes. To be on the safe side, I added 1 tsp of xantham gum, which not required in the original recipe. The original also calls for pure cocoa powder, which I replaced with carob powder. The pumpkin is such a versatile ingredient – from savoury dishes to sweet desserts, that I often like to have one lying around in the fridge as a staple, which explains the frequency of pumpkin recipes on this blog. 1 1/2 cups pumpkin, cooked and mashed — i didn’t have enough so made up the remainder with pureed canned pears (which I have frozen in ice cube trays for easy usage) and 1/2 cup of red lentil dip. The latter was added by accident as I thought it was pureed pear! I wasn’t concerned about the mix-up though, remember how Jessica Seinfeld puts all sorts of vegetables into sweet cakes in her Deceptively Delicious recipes. 1) Preheat oven to 200°C and grease muffin tins. 2) Beat butter and sugar until light & fluffy. 3) Beat eggs and add into butter/sugar mixture one tablespoon at a time and beat well after each addition. 4) Add mashed pumpkin and mix well. 5) Sift the dry ingredients together to mix thoroughly. 8) Spoon on topping mixture. 9) Bake in lower third of oven at 200°C for 20 minutes or until well done. Verdict: The flours I used seem to have a relatively neutral taste and this muffin tastes less ‘odd’ than the Kamut cranberry muffins. The carob topping seemed far too liquid, although it hardened nicely. Could have done without the carob topping. Can’t detect pumpkin taste. I like the way the ground seeds add body and protein to this muffin. Incidentally, I recently came across this excellent baking blog, Pattycake.ca, that includes many recipes for those facing gluten-free restrictions (and other special diets). Like me, the author enjoys the creative challenge of food restrictions! Kamut is another wheat substitute I’ve just tried. It’s supposed to be an ancient variety of durum wheat and replaces wheat easily in recipes. Kamut is a trademarked name for this strain. I got some Bob’s Red Mill brand kamut flour, which can be found in health food shops and Marketplace supermarkets. For my first kamut recipe, I also wanted to use the cranberries I had in the fridge, and fortunately I found this kamut cranberry muffin recipe. I omitted the orange peel and replaced the honey with light agave syrup. It also happens to be a buttermilk-based muffin recipe, which is similar to my current preferred basic muffin recipe. You can see my other buttermilk muffin recipes here. As buttermilk is rather expensive in Singapore, I always substitute it with milk+citric acid or cream of tartar (as I’ve described here), or use some of the yoghurt I already have in the fridge. I jazzed up these muffins with some inspiration from this kamut raisin walnut muffin recipe: I added a crumble topping made from kamut flour, sugar and butter (same as the recipe but I omitted the walnuts as I didn’t have any). Buttermilk muffins generally give a good texture so no problems there. The taste is discernable from wheat, but still very palatable. 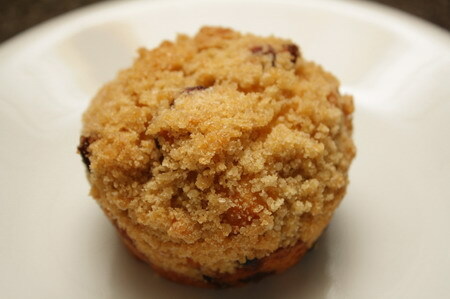 With the crumble topping, this muffin is sweeter than than the sugar-free muffins I tend to make, and cranberries provided a welcome change to the usual raisins, so this was a sweet treat rather than just a solid tummy-filler. Kamut flour is quite expensive though – a 567g (20oz) packet costing over S$5 would probably only last me two batches of muffins, so I don’t think I will be using it as a staple flour. Q: When is a yam not a yam? Bel on Where to buy takoyaki pans in Singapore? Gluten-Free Baking with The Culinary Institute of America: 150 Flavorful Recipes from the World's Premier Culinary… by Richard J. Coppedge Jr.
© Unauthorized use and/or duplication of this material without express and written permission from this blog’s author and owner is strictly prohibited. Excerpts and links may be used, provided that full and clear credit is given to Niceties and mainmainmasakmasak.wordpress.com with appropriate and specific direction to the original content.